Last name is not valid. Terms and Conditions are required. State or Province is required. Please enter a telephone number. Please enter your BRI Account number. Please select how you heard about us. Made several metal prints with top quality and fast turn around. My metal print arrived damaged, FedEx's fault. Black River Imaging handled them AND reprinted and shipped my print in time to get it onto a gallery wall just as a show opened. Kudos to Sarah and Jason. I've been using Black River for the last four years now for all of my prints on metal and I can say that I'm 110% satisfied not only with the product, but the customer service as well! If you have never seen a metal print before you are in for a treat. It's like looking at your image on an HD tv screen. The depth and clarity of the image is stunning, and the frameless modern look that you get with the float block backing allows the image to speak for itself. I love the vibrant high gloss option for the rich deep blacks and bright whites of my images. There really is no other medium out there that can produce the amazing results you get on metal. Thanks for the great product Black River!! 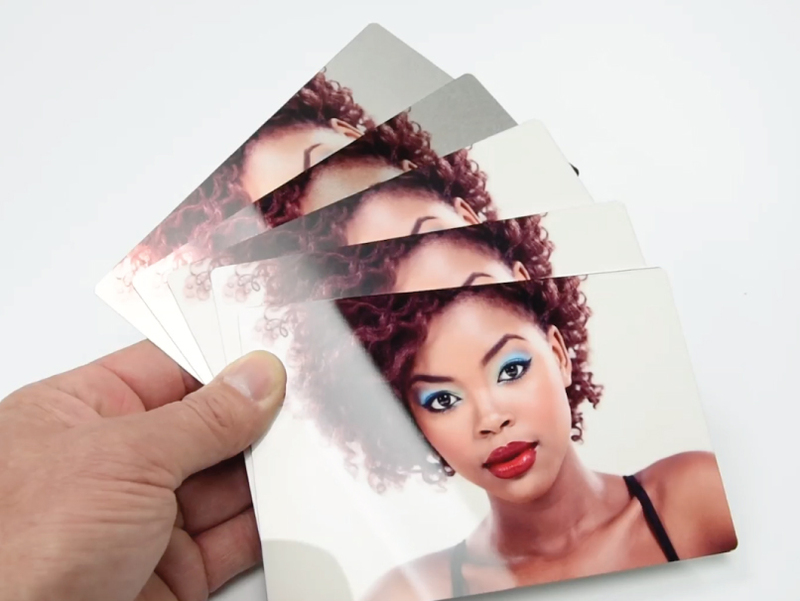 Metal Prints are made by fusing your image into specially treated aluminum. This results in prints that come alive and appear to be lit from within. Metal Prints are so versatile that portraits, fine art images and landscapes look amazing. 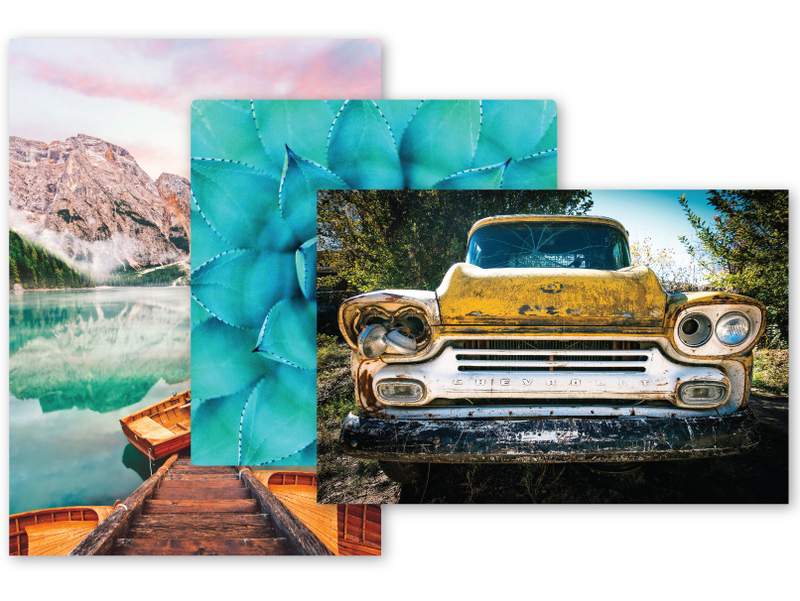 We use .045" thick, recycled aluminum sheets from ChomaLuxe to produce our high definition, vibrant prints that are eco-friendly, too. 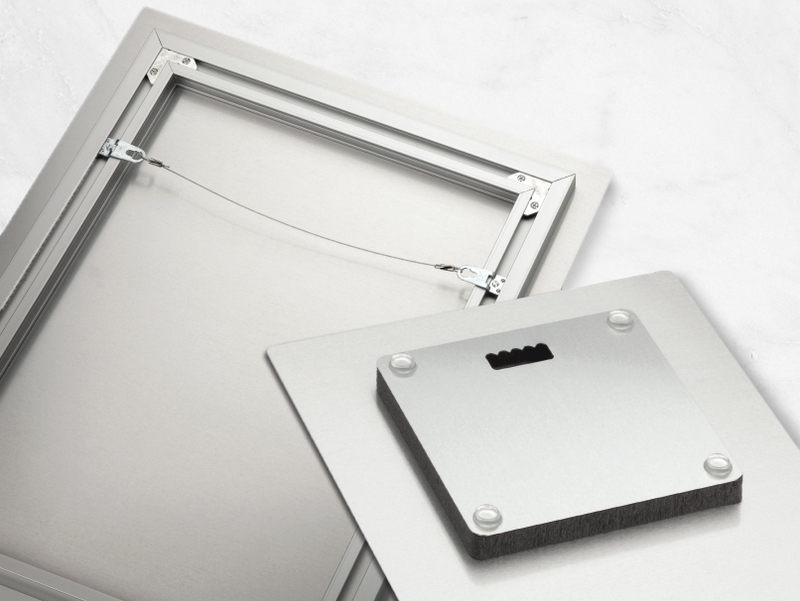 Hang with Corner Holes, Stainless Posts, Float Mounts and more. 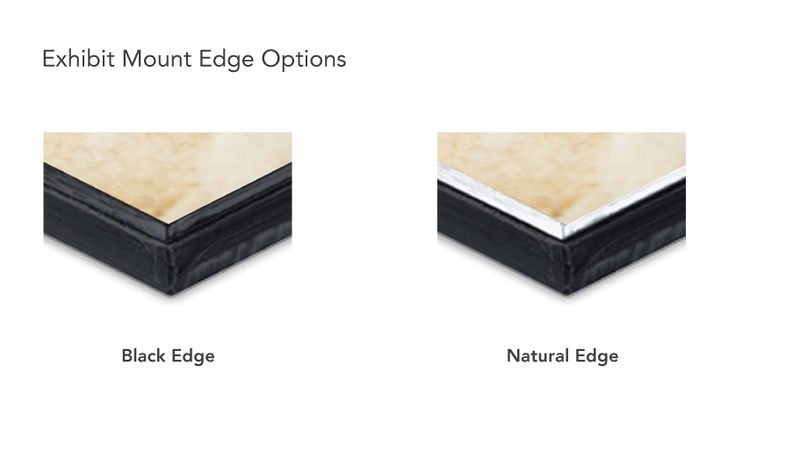 Choose surfaces in High Gloss, Mid-Gloss, Satin, Sheer Glossy, Sheer Matte, or all-weather Performance EXT. Sizes 4x4" to 48x96" or create your own custom size. Production in-lab turnaround time is 2-3 business days. Add 1-2 days for finishing & mounting. Standard Metal Prints are available in a variety of sizes, from 4x4" to 48x96". Custom Size Metal Prints are also available; see our Pricing tab for details. Metal Prints come in 5 Surfaces: High Gloss (was Vibrant Gloss), Mid Gloss, Satin (was Vibrant Matte), Sheer Glossy (was Metallic Fade Gloss) and Sheer Matte (was Metallic Fade Matte). Get a Sample Kit to determine which surface works best for your image. With the new Performance EXT Metal, Metal Prints will last 2-3 years in direct sunlight without noticeable fading. Specially engineered for outdoor art, photography, signage and display. Available with a High Gloss surface. Adds 2 business days to in-lab turnaround time. 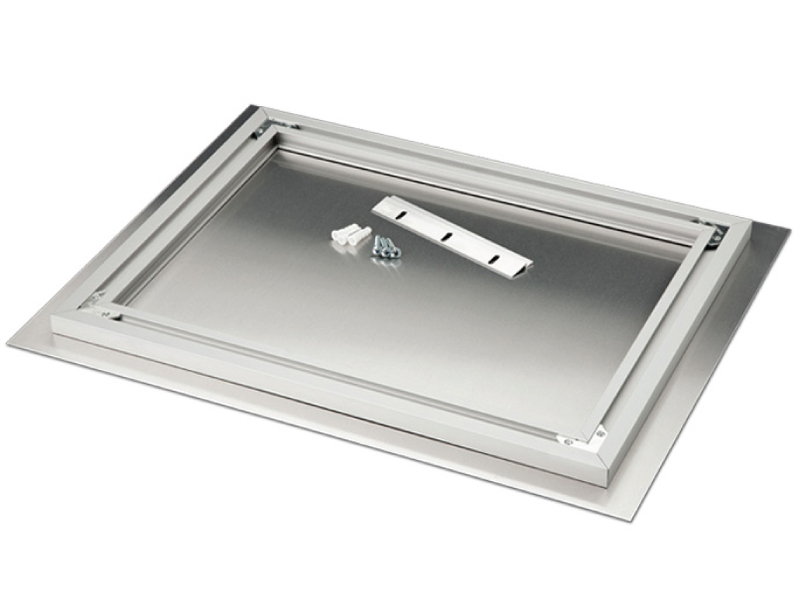 Choose from 4 Corner Options: Sharp Square, 1/8" Rounded, 3/16" Rounded or Scalloped. For smaller Metal Prints 4x4" to 16x16", choose easy and elegant Tabletop Display options like Metal Back Easels or Acrylic Easel Stands. See our Metal Print Display & Mounting tab for details. From gallery shows to home entryways, we have Wall Display options that fit your style, budget and need. 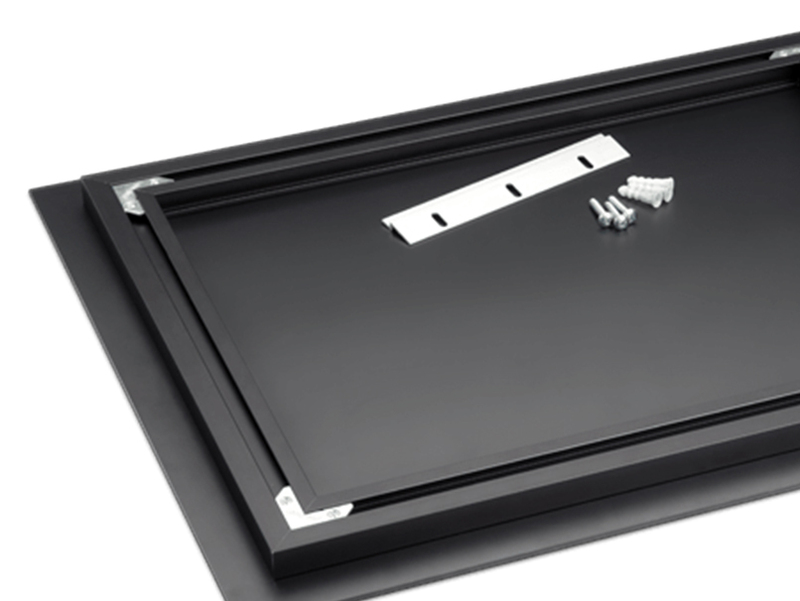 See our Display & Mounting tab for details. Retouching enhances your image for a flawless print. Choose from a variety of Retouching Services in the checkout cart. Additional fees apply. For more information, see our Retouching Services page. Impress clients with the personalized touch of Boutique Packaging for select, drop shipped items. We package your order in tissue paper and a black folder or box with a silver crepe bow. Additional fees apply. See Boutique Packaging for details. Acrylic Easel Stands are a simple, stylish way to display prints on a flat surface. Available in 8 sizes: 4x6", 5x5", 5x7", 8x8", 8x10", 8x12", 10x10" and 11x14". Metal Easel Back mounts on the back for either horizontal or vertical display. Available for sizes 4x4" to 16x16". To hang your Metal Print with your own wire or chain, opt for 3/16" Drilled Holes in 2 or 4 corners. Our Float Mount Hangers are attached to the back of the print, and float the print 1/2" off the wall when hung. Styles and selection vary based on the size of the print ordered. The Inset Frame is recessed from the edges of the print, so the print appears to float away from the wall. The 3/4" Deep Inset Frame is Silver only with French Cleat (shown) or Wire Hanger. The 3/4" Deep Inset Frame costs $25. For prints 8x8" and larger. The Inset Frame is recessed from the edges of the print, so the print appears to float away from the wall. 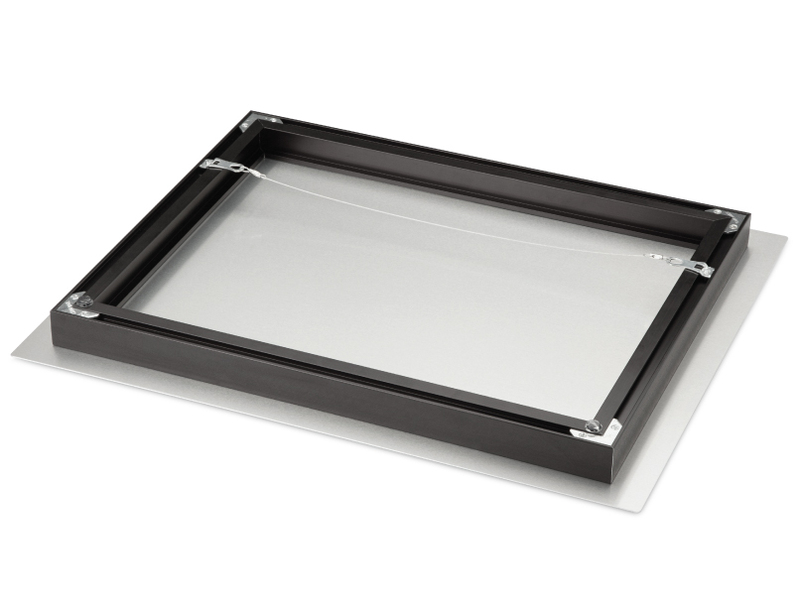 The 1-1/4" Deep Inset Frame in Black or Silver with a Wire Hanger only. The 1-1/4" Deep Inset Frame pricing varies by size, see the Pricing tab. For prints 8x8" and larger. If you handle or transport your Metal Prints frequently, choose an Exhibit Mount for added durability. Made of 2mm-thick black Styrene on the back of the Metal Print and finished with 3 Hanging Options: 3/4" Deep Metal Inset Frame with French Cleat, 3/4" Deep Metal Inset Frame with Wire Hanger, or 1/2" Deep Float Mount Hanger. 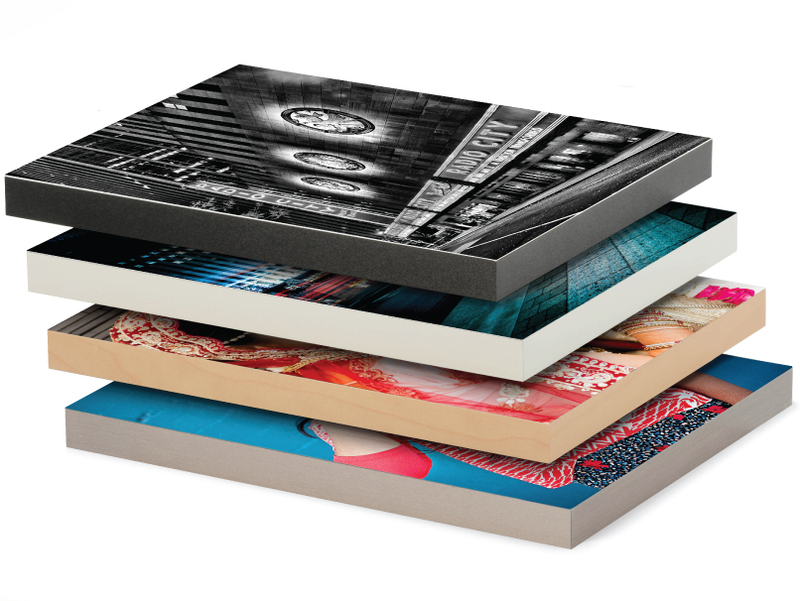 Exhibit Mounts include either a Black or Natural edge option for your print. Available in print sizes 8x8" to 48x96". 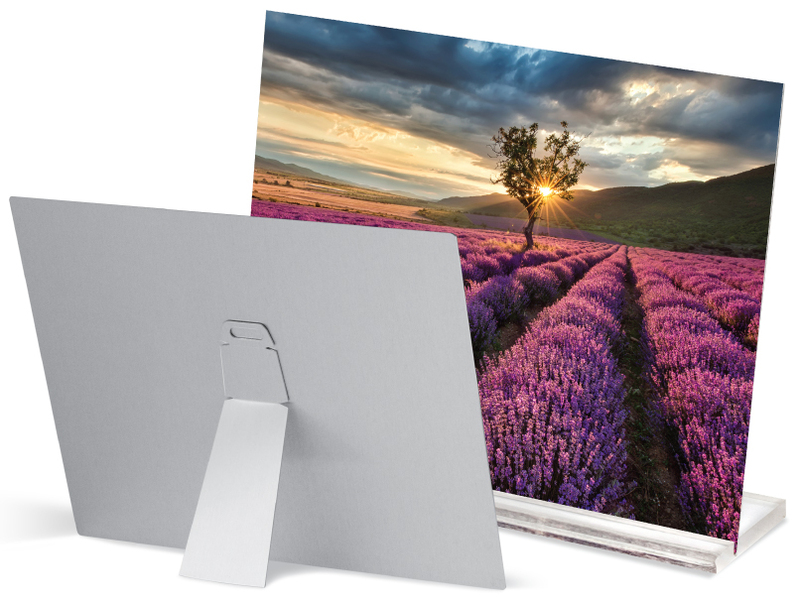 Flush to the edge of the print, Standout Mounts are a sleek and clean display for Metal Prints. Standout Mounts with Foamboard are thick yet lightweight and finished with 3/4" or 1-1/2" edging in Black, White, Brushed Stainless or Maple. Come with keyhole options for easy hanging. 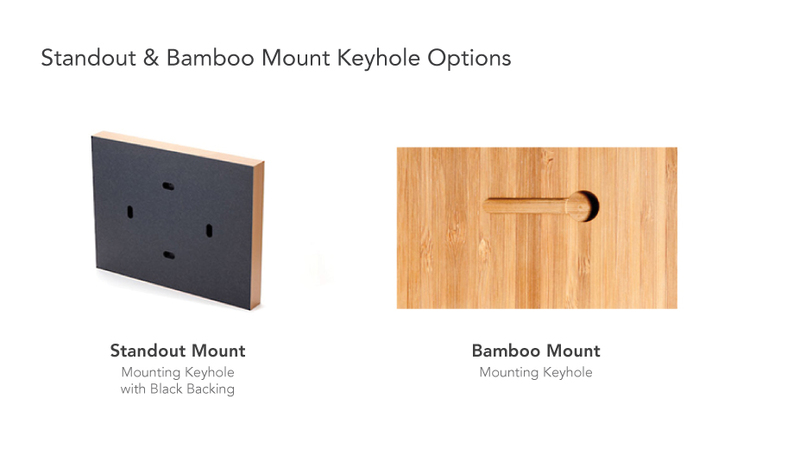 Standout Mounts of Bamboo are 3/4'' thick and made from organically grown, renewable, and FSC-certified bamboo. A heavier weight than our Foamboard Standout Mounts, Bamboo Mounts are also great for the environment. Come with keyhole options for easy hanging. 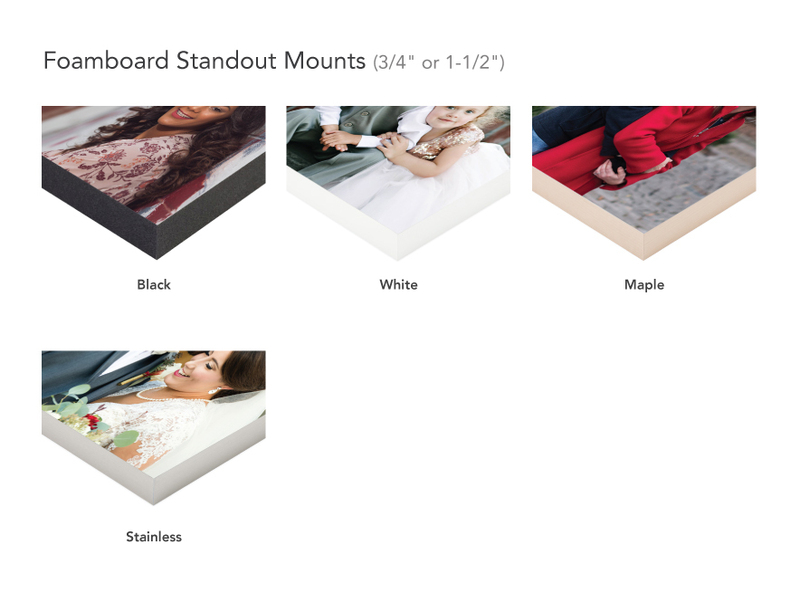 Heavier than our Foamboard Standout Mounts, Metal Standout Mounts are made of durable metal in a generous 1-1/4" depth. Available in 6 edge colors: Black, Silver, Gold, Copper, Light Pewter or Dark Pewter. Come with a wire hanger for easy hanging. Secure your Metal Print in public settings with a Security Screw and Wrench. 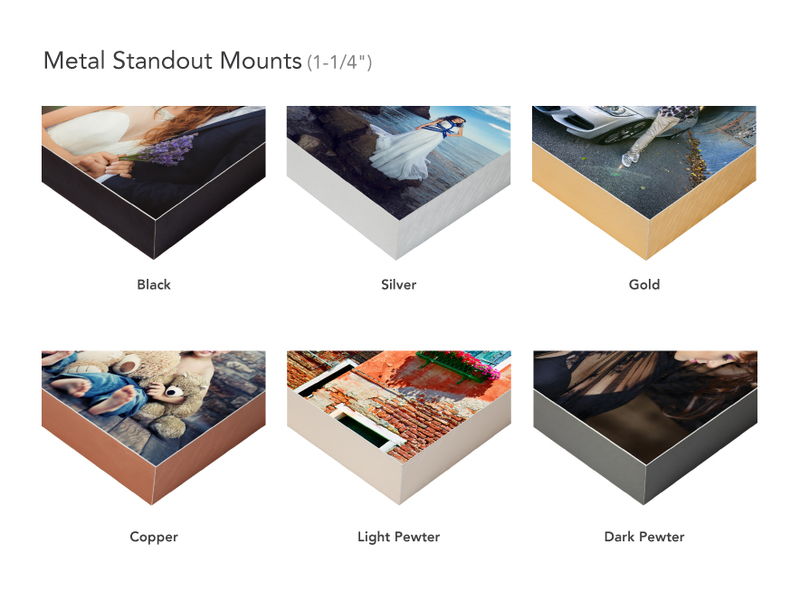 Works with your Metal Print's existing mount system (specifically, Inset Metal Frame, Metal Exhibit Mount or Metal Standout Mount) for prints 8x8" and larger. Set is $3.50 ($2.50 without Wrench). For added support and stability, the Cleat Hanger Kit screws into your Metal Print's existing mount system (¾" Inset Frame or ¾" Metal Exhibit Mount). The kit can be used in tandem with another cleat for large prints, or as an alternative to a wire hanger so the print hangs flush with the wall. 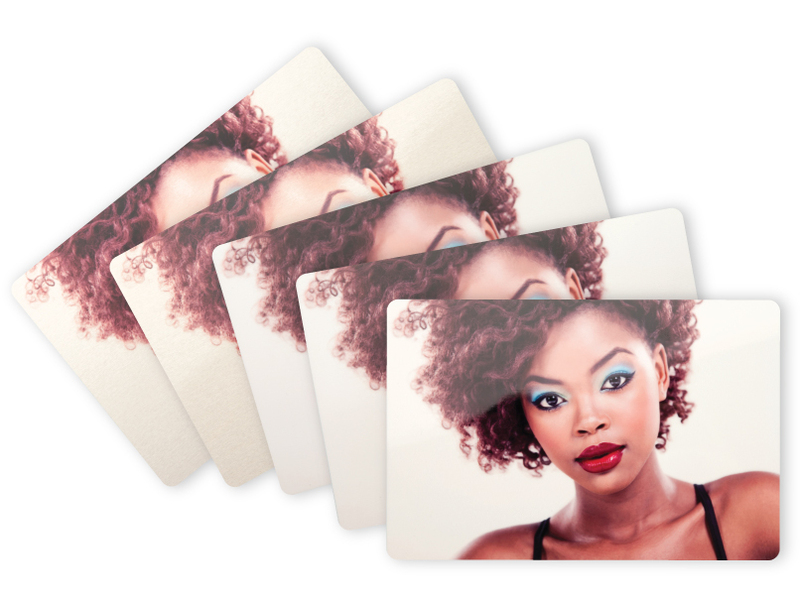 Our kit includes five (5) 4x6 metal prints at a discounted price in each of our surfaces: High Gloss (aka Vibrant Gloss), Mid-Gloss, Satin (aka Vibrant Matte), Sheer - Glossy (aka Metallic Fade Gloss) & Sheer - Matte (aka Metallic Fade Matte). Mounting and corner options can be selected individually for each print. It is a great way to see first hand the unique qualities of these brilliant prints. Compare our surfaces. *Freight Shipping: Metal Prints with a side over 40" long will require freight shipping. We can provide freight quotes for these orders. Please allow additional time for the quote and freight delivery times. Custom Size Metal Prints can be ordered in BRI ROES in any size between 4x4" and 48x96" (whole numbers only). Custom Size Metal Prints are billed at the time of invoicing at $0.26 per square inch. A $20.00 minimum is applied to each print ordered. Custom Size Metal Prints that are larger (one dimension over 40" long or both dimensions each over 30" long) require a wooden shipping crate at an additional charge (see table above). Additionally, Custom Size Metal Prints with a side over 40" long may require freight shipping. We can provide a freight quote. Please allow additional time for the quote and freight delivery times. Metal Prints are coated using state-of-the-art coating machines. But the coating sometimes contains small imperfections such as small craters or bumps. We inspect each sheet very carefully and if there are imperfections we place them in the most unobtrusive parts of the image. We cannot remake Metal Prints due to these imperfections unless they are located in a very prominent part of the image. Metal Prints are weatherproof and moisture proof, but they will fade like a normal photograph, so please avoid direct sunlight. *Sharp Square Corners, can be quite sharp and should be handled with care. 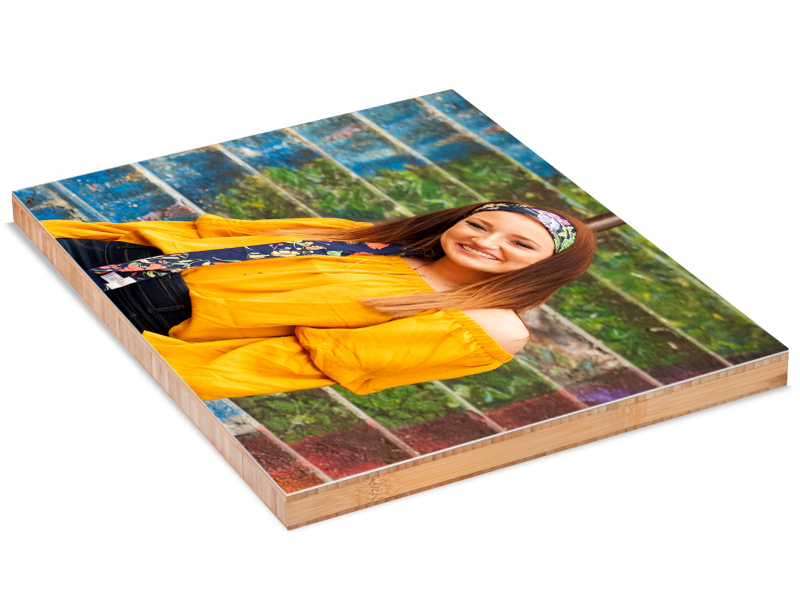 We recommend ordering Rounded Corners on Metal Prints that will be displayed in areas where people may be close to or seated underneath the Metal Prints. Please allow an additional 1-2 business days to metal print turnaround time for mounting options. 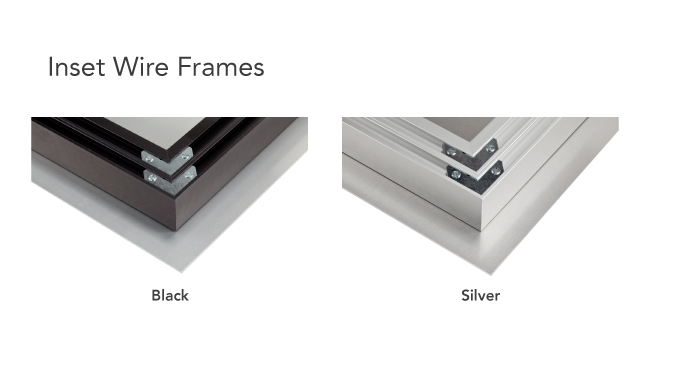 Inset Frame 3/4" or 1-1/4"
Only available with Exhibit Mounts, 1-¼" Inset Frames and 1-¼" Metal Standout Mounts. Pros prefer BRI ROES, our downloadable desktop app. It's the fastest way to order when your client needs multiple images and sizes, or you want to place several orders at once. Order directly from our website with no software download required. Ideal for simple, small orders. Click here for our current specials. Be in the know and sign-up for our newsletter. Read the latest on our blog.